Bahria Town Karachi has introduced an amazing concept of life and leisure in the form of Bahria Golf City Karachi. Bahria Golf City is designed as the overseas block for Bahria Town Karachi offering residential plots and luxury villas. Bahria Golf City will have the first ever 27-hole PGA Standard Golf Course for the Golf enthusiasts in Pakistan and overseas. Previously we have seen that Bahria Town has launched Golf City projects in Islamabad and Lahore, among whom Islamabad Golf City has been the most expensive projects as it captivates the features and locality of the Murree Expressway. However, Bahria Golf City Karachi will be the first of its kind and is expected to be a great success. 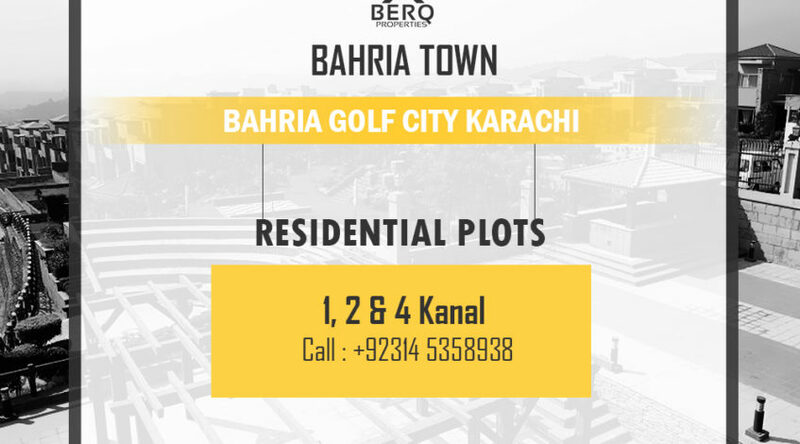 Bahria Golf City offers residential plots in 1 Kanal, 2 Kanal, and 4 Kanal, with a quarterly installment plan of 4 years and 25 percent down payment. Bahria Golf City Karachi is centrally located in the beautiful Bahria Town Karachi having a direct access from the 400 ft wide Jinnah. It covers precinct 20, being the largest precinct in Bahria Town Karachi. Down payments and the total amount money has been mentioned in the table below, whereas the complete amount is to be paid in 16 installments on a quarterly basis.